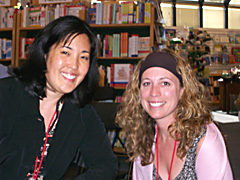 Book Passage is pleased to announce the 5th Annual Book Passage Children's Writers & Illustrators Conference, which will take place June 16-19, 2011 at Book Passage, 51 Tamal Vista Blvd., Corte Madera, CA 94925. Located just 15 minutes across the Golden Gate Bridge from San Francisco, this conference brings together some of the best writers and illustrators of children's books and young adult literature in the country. The conference is appropriate for writers and illustrators at all levels--those both seasoned and those just starting their careers. Mac Barnett, Jennifer L. Holm, Kathryn Otoshi & Laura Rennert, and many more! This year's Conference boasts an outstanding faculty of writers, illustrators, agents, and publishing professionals including Chronicle Books publisher Christine Carswell, president & publisher of Random House Children's Books Chip Gibson, author of Anya's War Andrea Alban, author of The Clock Without a Face and the Brixton Brothers series Mac Barnett, the "Author Enablers" Sam Barry and Kathi Kamen Goldmark, award-winning authors Thacher Hurd and Jennifer L. Holm, Bram Stoker Award-nominated YA author Linda Watanabe McFerrin, McSweeeney's editor and art director Brian McMullen, editor and author of Me, Frida Amy Novesky, author-illustrator Kathryn Otoshi, agents Laurie McLean (Larsen-Pomada Literary Agency), Laura Rennert (Andrea Brown Literary Agency), Danielle Svetcov (Levine-Greenberg Literary Agency), and many more! The Conference will cover all aspects of writing and illustrating for children--from developing ideas to honing skills to finding a publisher. Students will work closely with other writers and illustrators, as well as with agents, editors, and publishers. The conference is designed to meet the differing needs of those who create for different age groups. Mornings: Students select an area of interest, such as writing for picture books, middle readers, young adult books, or illustration. Morning sessions are spent with a single teacher or team of teachers on that subject. The cost of the four-day Conference is $475. Optional 30-minute private consultations are available for $95. Don't hesitate to call us for more information at (415) 927-0960, ext. 239 or email bpconferences@bookpassage.com.